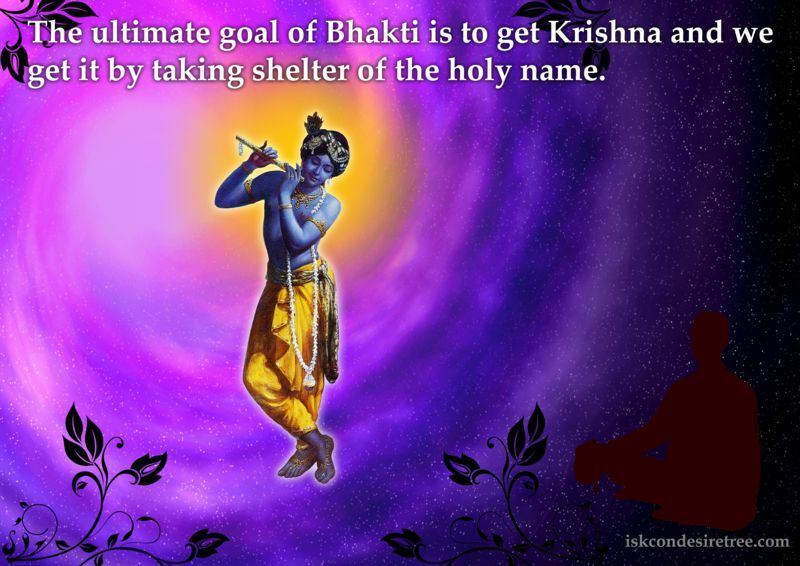 How to improve our Bhakti ? There could be many answers to this question. Prabhuji shared with me that he is already chanting 16 rounds and following four regulative principles hence I am sharing the verses I read today morning in Chaitanaya Charitramrita. These verses are spoken by Mahāprabhu in his teachings to Sri Sanatana Goswami and explain 64 important items in devotional service after one is fixed in his sadhana bhakti. CC Madhya 22.121: “After one is established in devotional service, the positive actions are (1) hearing, (2) chanting, (3) remembering, (4) worshiping, (5) praying, (6) serving, (7) accepting servitorship, (8) becoming a friend and (9) surrendering fully. CC Madhya 22.122: “One should also (10) dance before the Deity, (11) sing before the Deity, (12) open one’s mind to the Deity, (13) offer obeisances to the Deity, (14) stand up before the Deity and the spiritual master just to show them respect, (15) follow the Deity or the spiritual master and (16) visit different places of pilgrimage or go see the Deity in the temple. CC Madhya 22.123: “One should (17) circumambulate the temple, (18) recite various prayers, (19) chant softly, (20) chant congregationally, (21) smell the incense and flower garlands offered to the Deity, and (22) eat the remnants of food offered to the Deity. CC Madhya 22.124: “One should (23) attend ārati and festivals, (24) see the Deity, (25) present what is very dear to oneself to the Deity, (26) meditate on the Deity, and (27-30) serve those related to the Lord. CC Madhya 22.125: “Tadīya means the tulasī leaves, the devotees of Kṛṣṇa, the birthplace of Kṛṣṇa (Mathurā), and the Vedic literature Śrīmad-Bhāgavatam. Kṛṣṇa is very eager to see His devotee serve tulasī, Vaiṣṇavas, Mathurā and Bhāgavatam. CC Madhya 22.126: “(31) One should perform all endeavors for Kṛṣṇa. (32) One should look forward to His mercy. (33) One should partake of various ceremonies with devotees — ceremonies like Lord Kṛṣṇa’s birthday or Rāmacandra’s birthday. CC Madhya 22.127: “(34) One should surrender to Kṛṣṇa in all respects. (35) One should observe particular vows like kārtika-vrata. These are some of the sixty-four important items of devotional service. Q: A question may arise if there any main limbs from the above instructions ? And secondly do we need to follow all of them to achieve perfection in our devotional service ? CC Madhya 22.128: “One should associate with devotees, chant the holy name of the Lord, hear Śrīmad-Bhāgavatam, reside at Mathurā and worship the Deity with faith and veneration. CC Madhya 22.129: “These five limbs of devotional service are the best of all. Even a slight performance of these five awakens love for Kṛṣṇa. CC Madhya 22.130: “‘With love and full faith one should worship the lotus feet of the Deity. CC Madhya 22.131: “‘One should taste the meaning of Śrīmad-Bhāgavatam in the association of pure devotees, and one should associate with the devotees who are more advanced than oneself and who are endowed with a similar type of affection for the Lord. CC Madhya 22.134: “When one is firmly fixed in devotional service, whether he executes one or many processes of devotional service, the waves of love of Godhead will awaken. CC Madhya 22.135: “There are many devotees who execute only one of the nine processes of devotional service. Nonetheless, they get ultimate success. Devotees like Mahārāja Ambarīṣa execute all nine items, and they also get ultimate success. I would like to thank Jitendra Prabhuji for asking such a nice question as I leaned a lot just by thinking about what to reply to him ! Then today morning out of sheer luck or causeless mercy I read these verses and I thought that these verses would be relevant to all the devotees as they are spoken by Lord Himself. I hope the above answer satisfies Jitendra Prabhuji. I have opened a separate page Q&A on the website and a separate page to post your questions. I will post questions asked by readers on the Q&A page only. I will try to share only those answers on the main blog post which do not have contamination of my own intelligence and speculation. This entry was posted in My spiritual Journey, Q&A and tagged deity, deity worship, five main limbs in devotional service, how to improve bhakti, nine limbs of bhakti, reading srimad bahagavatam, residing in dhama, Sadhna Bhakti, Sanatana Goswami, teachings of Mahaprabhu, what does association of devotees mean, what si the meaning of staying in Vrindavana. Bookmark the permalink. ← What is the purpose of Varnashrama Dharma? There is one question. How can one serve Mathura and Bhagawatam? Thank you for reading the blog of this fallen soul. As per my little understanding we can serve book Bhagavatam by reading it daily and the person Bhagavat by serving him nicely. We can serve Dhama is many different ways like circumbalating it, by serving the devotees who reside there, by visiting Dhama regularly, etc. You may find the below blog helpful in understanding how Srila Prabhupada made all the arrangements for these five most important limbs of bhakti under ISKCON itself. Thank you Prabhuji for your valuable explanation. all glories to srila prabhupada !! !